Since its original publication in 1987, Channels of Discourse has provided the most comprehensive consideration of commercial television, drawing on insights provided by the major strands of contemporary criticism: semiotics, narrative theory, reception theory, genre theory, ideological analysis, psychoanalysis, feminist criticism, and British cultural studies. The second edition features a new introduction by Robert Allen that includes a discussion of the political economy of commercial television. Two new essays have been added--one an assessment of postmodernism and television, the other an analysis of convergence and divergence among the essays--and the original essays have been substantially revised and updated with an international audience in mind. Sixty-one new television stills illustrate the text. Each essay lays out the general tenets of its particular approach, discusses television as an object of analysis within that critical framework, and provides extended examples of the types of analysis produced by that critical approach. Case studies range from Rescue 911 and Twin Peaks to soap operas, music videos, game shows, talk shows, and commercials. Channels of Discourse, Reassembled suggests new ways of understanding relationships among television programs, between viewing pleasure and narrative structure, and between the world in front of the television set and that represented on the screen. The collection also addresses the qualities of popular television that traditional aesthetics and quantitative media research have failed to treat satisfactorily, including its seriality, mass production, and extraordinary popularity. 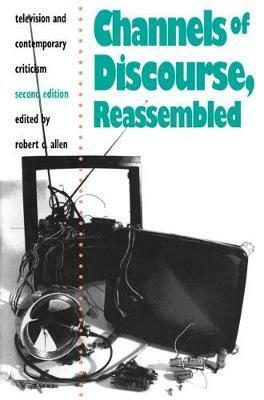 Since its original publication in 1987, Channels of Discourse has provided the most comprehensive consideration of commercial television, drawing on insights provided by contemporary criticism: semiotics, narrative theory, reception theory, genre theory, ideological analysis, psychoanalysis, feminist criticism, and British cultural studies. Will no doubt be lapped up by the new breed of media brat. "Time Out"
Robert C. Allen is Smith Professor of Radio, Television, and Motion Pictures and associate dean of the College of Arts and Sciences at the University of North Carolina at Chapel Hill. He is author of "Speaking of Soap Operas" and "Horrible Prettiness: Burlesque and American Culture" and coauthor of "Film History: Theory and Practice."